Are you and your family looking for a capable, family-friendly compact crossover? 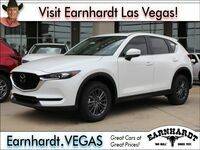 Families who have come to know and love the Mazda brand will love what the 2018 Mazda CX-5 brings to the table at Earnhardt Mazda Las Vegas. Learn more about the Mazda CX-5 and how it stacks up against an elite competitor with this in-depth 2018 Mazda CX-5 vs 2018 Honda CR-V comparison. When you choose the 2018 Mazda CX-5, you will have a choice of three fully-loaded trim levels – Sport, Touring and Grand Touring – that will start at an affordable price. With room for five passengers in a family-friendly cabin that adds 30.9 cubic feet of cargo space behind the second row that can expand to 59.6 cubic feet with the 60/40 split-folding rear seats laid, the Mazda CX-5 is perfect for day-to-day errands and neighborhood carpools. What Are the Differences Between the Mazda CX-5 and the Honda CR-V? 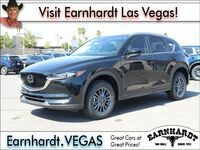 An athletic style and performance are trademarks of the Mazda CX-5 crossover at Earnhardt Mazda Las Vegas and make the Mazda fan favorite stand out in this 2018 Mazda CX-5 vs 2018 Honda CR-V comparison. Armed with an affordable price tag that stands at $24,150 and an impressive list of standard features, the Mazda CX-5 provides elite value when pitted against the Honda CR-V and delivers award-winning safety ratings. Fixtures of the Mazda CX-5 Sport trim level include a standard 7-inch MAZDA CONNECT™ touchscreen infotainment system that provides easy access to Bluetooth, streaming music, 17-inch alloy wheels, an electronic parking brake and a rearview camera. To make the entry-level Mazda CX-5 Sport even more attractive to families, it will add standard Blind-Spot Monitoring with Rear Cross-Traffic Alert and an IIHS Top Safety Pick+ award. An available i-ACTIVSENSE® Package will upgrade safety with the addition of High Beam Control, Lane Departure Warning, Lane-Keep Assist, Mazda Radar Cruise Control, Smart Brake Support and automatic headlights. Upgrades to the Mazda CX-5 spec sheet include 19-inch alloy wheels, premium leather upholstery, an Active Driving Display and an Adaptive Front Lighting System. Under the hood, the 2018 Mazda CX-5 will feature an athletic 187-horsepower 2.0-liter SKYACTIV®-G four-cylinder engine that will be paired with a six-speed SKYACTIV®-Drive automatic transmission with manual shift and Sport Mode. With this combination under the hood, the Mazda CX-5 will earn 25 mpg in the city and 31 mpg on the highway. When you add i-ACTIV AWD®, the athletic Mazda CX-5 will still make 24 mpg in the city and 30 mpg on the highway.